From the natural beauty of Mount Fuji to the spectacular skyline of Tokyo, enigmatic Japan offers a unique tour experience. Discover ancient temples, enjoy a traditional tea ceremony and travel on the famous Bullet Train as you explore this country of contrasts. Make your own way to Tokyo. Get to know your travelling companions over a welcome drink and dinner. Tokyo is a dazzling city of contrasts. Traditional temples, shrines and gardens sit alongside ultra-modern skyscrapers and designer shopping outlets, and we’ll discover more on our included tour. A real highlight is Tokyo Tower, an Eiffel Tower-inspired lattice structure rising 1,093 ft high. Here we’ll head up to the Observation Deck for stunning views over the city, with even Mount Fuji in our sights if it’s a clear day. We’ll also make a stop close to the Imperial Palace, the main residence of the Emperor of Japan. Next we’ll view the stunning 7th century Asakusa Sensoji Temple, and to top it all off, we’ll experience an authentic rickshaw ride too. Dinner tonight is served as we cruise the Sudima River on board a traditional and ornate Yakatabune boat, where we’ll enjoy wonderful views of the city’s illuminated skyline. Iconic Mount Fuji, Japan’s tallest peak, is our destination today. We’ll cruise on Lake Ashi, with its fabulous views of Fuji, before travelling by cable car and visiting Owakudani, a volcanic valley with active sulphur and hot springs known as the Great Boiling Valley. We’ll also visit the natural thermal springs of Atami Onsen before settling down for an overnight stay in the popular seaside spa resort of Atami. Kyoto is nicknamed ‘the city of ten thousand shrines’ and is where we’ll stay for the next three nights. We’ll transfer here today on Japan’s famous Bullet Train. On our city tour we’ll visit the famous Golden Pavilion, a stunning temple covered with pure gold leaf. We’ll also tour the stunning Heian Shrine, with its giant entrance gate and beautiful Japanese gardens, before sightseeing in the Gion area. This is Kyoto’s most famous Geisha district and is filled with teahouses where Geisha entertain. There’s plenty of free time for shopping or relaxing, too. Kyoto is a truly enchanting city. We’ll explore further today as we visit the beautiful Kiyomizu Temple, which is built into the side of a mountain, supported by pillars. It takes its name, which means ‘clear water’, from a waterfall within the temple complex. In Fushimi, Kyoto’s traditional sake-brewing district, you can find out more about the long history of this traditional fermented rice drink. 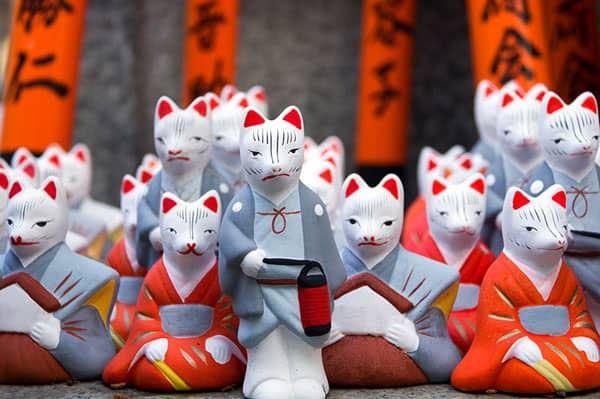 We’ll visit the Gekkeikan Okura Sake Museum for a tasting session, before heading to Fushimi Inari, a vast tribute to the gods of rice and sake, with its winding mountain trails leading to a series of stunning shrines. Look out for the dozens of stone foxes you’ll see en route – foxes are considered messengers of the gods. We’ll round off today’s fascinating cultural experiences with a traditional Uji Japanese tea ceremony. Today we include a visit to historic Nara, the ‘City of Temples’. Here we will see Todaiji Temple, with its huge bronze Buddha statue, and Deer Park, home to hundreds of free-roaming deer. In the afternoon, we’ll visit Osaka, stopping for photographs at the beautiful Osaka Castle, one of the most famous castles in Japan. We’ll see the Umeda Floating Garden, a spectacular building made up of two towers connected on the 39th floor by the ‘Floating Garden Observatory’. We’ll also take in the shops and restaurants of the Dontonbori shopping area, before returning to Kyoto tonight. Hiroshima is an intriguing city with many fascinating sights and we’ll head here today by Bullet Train. 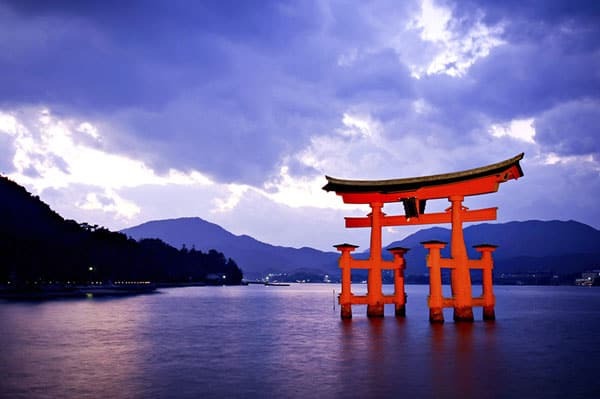 We’ll visit Miyajima Island, one of the most scenic spots in Japan, known for the floating shrine of Itsukushima, before arriving at our hotel where we’ll stay tonight. Later, why not try your hand at okonomiyaki-making. Often referred to as Japanese pancakes or Japanese pizza, this unique dish is actually quite different to both – taste it and see what you think! Our Hiroshima sightseeing tour today takes in the poignant sights of the Peace Memorial Park and A-Bomb Museum. Dedicated to Hiroshima’s nuclear bombing in the Second World War, the park was built on an open field created by the explosion. From the central cenotaph, view the A-Bomb Dome – this is the skeletal ruins of the former Industrial Promotion Hall, left untouched after the bombing as a constant reminder of the victims and the need for peace. After our visit, we’ll stop by the beautiful Shukkeien Garden, whose name means ‘landscape garden in miniature’ and is an imitation of West Lake in Hangzhou, China. Badly damaged by the atomic bombing in 1945, it was restored and reopened in 1951. We’ll also visit the beautifully preserved canal area of Kurashiki, where the former storehouses that line the canal have been converted into smart boutiques and quaint cafés. The pretty port city of Kobe is where we’ll head today for an overnight stay. En route, we’ll visit gardens at Himeji Castle, a fantastic hillside complex dating back to 1333. There’s plenty of time to explore Kobe at your own pace. Perhaps you’ll visit Harbourland, the popular shopping and entertainment complex, or journey on the Shin-Kobe Ropeway cable car for great views over the city. Tonight, gather together with your fellow travellers to enjoy an authentic farewell dinner . 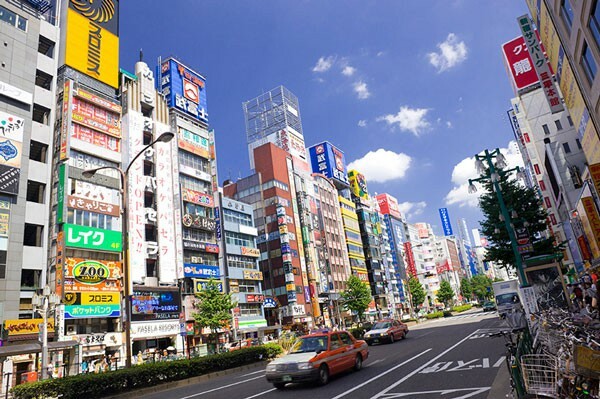 Today you can join your fellow travellers on a transfer to Osaka airport or choose to make your own arrangements.